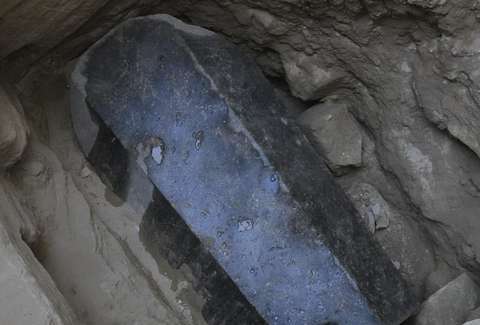 The biggest sarcophagus ever unearthed in the Egyptian port city of Alexandria will soon be hatched open and examined, archeologists say. The black granite tomb was discovered with an alabaster bust, leading to speculation that the inhabitant could perhaps be an Egyptian dignitary buried some 2,000 years ago during the Ptolemaic period, in roughly 305 to 30 B.C. The find has archaeologists giddy, largely because it was located by happenstance, during a construction dig. And yes, it is a large crypt, presumably carrying a large mummy: The casing is almost 6-feet high and 9-feet long, according to the Guardian. "The alabaster head is likely that of a nobleman in Alexandria. When we open the sarcophagus, we hope to find objects inside that are intact, which will help us to identify this person and their position," he told the paper. According to Egypt's Ministry of Antiquities, the sarcophagus was buried 16-feet underground. Prying the lid open and simultaneously preserving the ancient tomb's integrity will be difficult. It's a hulking load of 30 tonnes altogether, so the utmost preparation will be necessary, per Ashmawy.